The spot has the feeling of a cult classic. In advertising, "weird" is a difficult thing to get right. Go too far and you’ll alienate people; be too cautious and you won’t stand out. Over the years, brands like Old Spice and Skittles have mined rich seams of surreality and outright oddity to massive sharing success and critical kudos. With its latest offering, "Streaming consciousness", the brand channels indie curios like Being John Malkovich and Napoleon Dynamite in order to push its streaming plan. As one part of Three’s larger "Go binge" campaign (already infamous for featuring a half-sloth-half-dolphin as its mascot), this new spot is a bold and bizarre short film, as arthouse as it is advertising. "Streaming consciousness" opens in a rather mundane electronics shop, the kind that’d go unnoticed on any English high street. Inside, the lanky owner shuts up for the day before changing into a yellow turtleneck and blazer, and beckoning a group of strangers into the shop. As they enter, he mutters "Namaste", and they hand him old television sets. As it turns out, this shop is a kind of support group for online streamers. 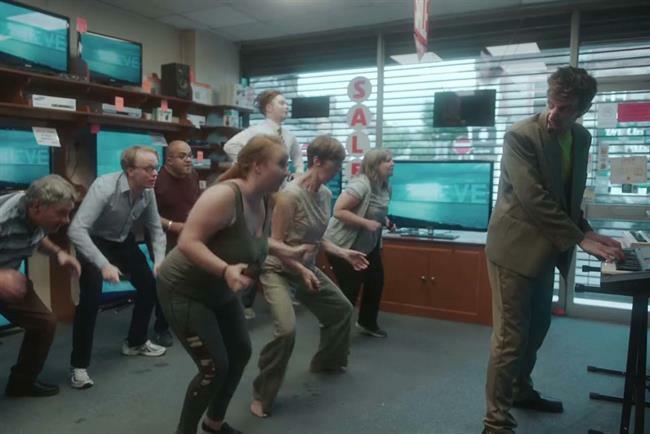 With their phones pressed to their faces, the participants follow the orders of the shop-owner as he leads them through a sort of smartphone-based yoga routine. They twist through various postures and, on cue, all say: "I love my device". It’s something like a cross between an inspirational talk and a gathering of an esoteric cult. To help bring the offbeat vision of "Streaming consciousness" to the screen, Three enlisted the help of Belgian filmmaker Tom Geens. Geens is known for his strange, unsettling work in feature films and that comes across in the rather oppressive scene which plays out. The various streamers dance around the electronics shop, entranced by their various devices, while the owner plays the synth and the viewer grows ever more bewildered. Is "Streaming consciousness" too weird to be an online success? At nearly five minutes, it’s certainly on the lengthy side but you have to credit Three’s boldness. Like the films it's aping, the spot has the feeling of a cult classic, all the more appreciated for putting off a few people with its oddity.